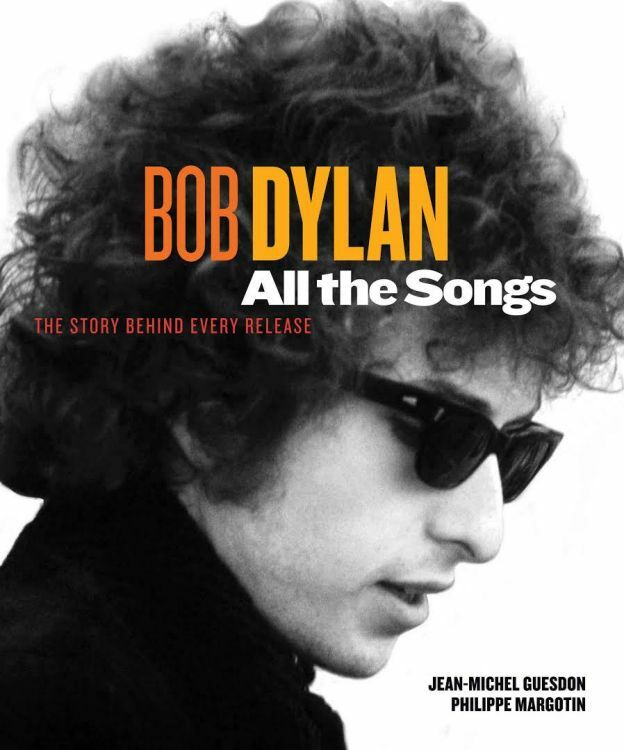 ALL THE SONGS (BOB DYLAN) - THE STORY BEHIND EVERY TRACK, by Philippe Margotin and Jean-Michel Guesdon, Black Dog & Leventhal October 2015, 704 pages. same - THE STORY BEHIND EVERY RELEASE, pre-publication cover (digital picture only, no real existence). James Brockman binding . 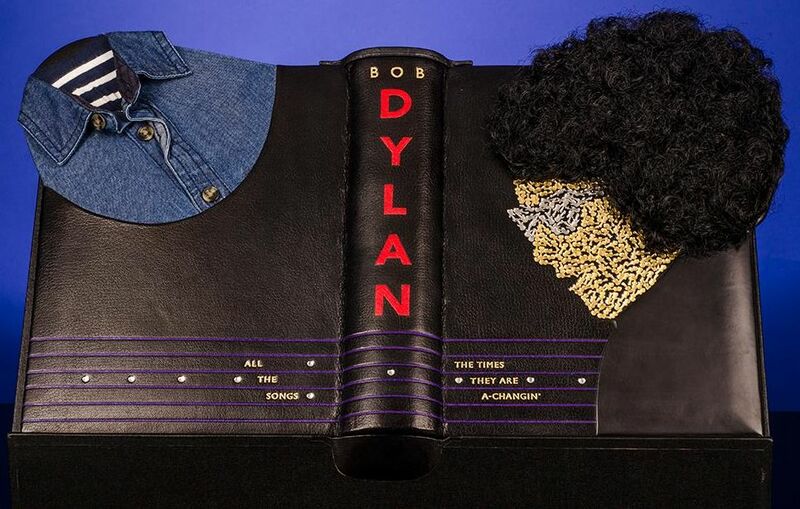 "A truly innovative and amazing binding by James Brockman for All The Songs, completed in 2017, full black goatskin over laminated cushioned boards. Front cover scalloped and elaborately tooled with guitars in gold and palladium leaf and lettered in gold and palladium "The Times They Are A-Changin'". The scalloped top edge with 'hair' on-lays creating the profile of a young Bob Dylan. 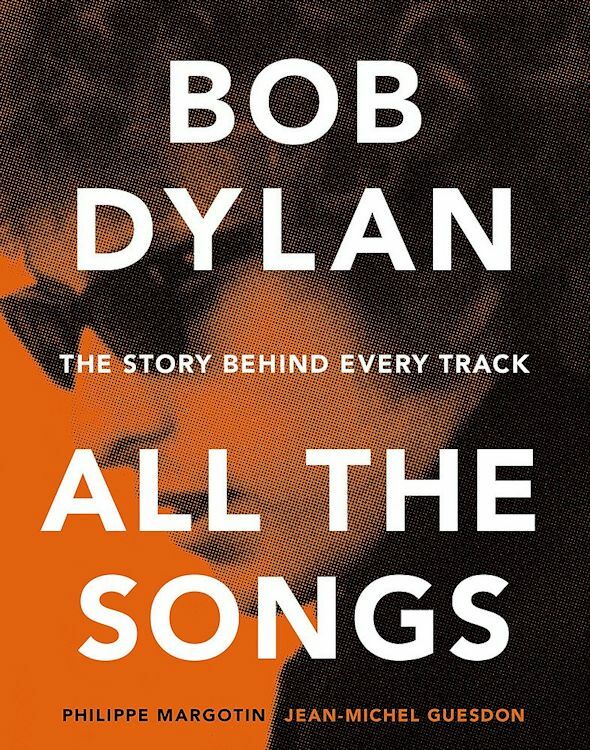 The rear cover scalloped with a blue denim tea-shirt with three buttons and lettered in gold and palladium "All The Songs". Smooth spine lettered with "Bob" in gold and "Dylan" inlaid with five pieces of red morocco. Lower part of spine a single palladium 'dot' . There are six lines of inlaid purple morocco that go all the way round the front cover, spine and rear cover. Japanese paper doublures with sunken gold paper and pieces of vinyl records, matching Japanese paper end-leaves, all edges gilt and gauffered in the style of a guitar fretboard with palladium circles representing the position markers.